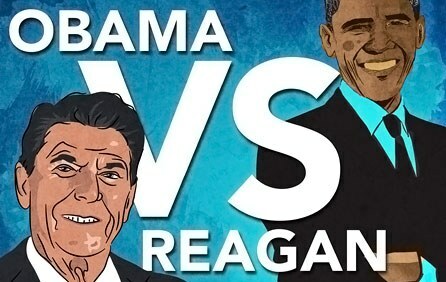 A recent article by Forbes stated that Barack Obama created more jobs, with less deficit spending than Ronald Reagan. Thus, economically speaking, he is one of the most successful presidents in history. And, the article was right, at least it was in terms of the pure, hard numbers—and numbers don't lie, or so they tell me. But, numbers aren't always what they seem. There are, in fact, numbers within numbers, that drive numbers. "Man, that sounds boring." I understand, believe me I do. If we're going to compare the Reagan years to the Obama years we need to look at some very real differences. Here's the first; in 1980, when Reagan first took office, the prime interest rate was about 20%, a staggeringly high number, virtually unprecedented in American history. Why were interest rates so high? Because of runaway inflation in the 1970s. Meaning; that prices on everything from milk to gas, to medicine, cost a lot more. It also meant that borrowing money to start a business, buy a house, a car, or simply using a credit card to buy your kid's clothes for the new school year, was so expensive, that nobody spent money, not unless they had to. This threw the nation deep into recession—and unemployment skyrocketed as the result. That was the world that Reagan inherited. Today, the prime interest rate is about 3%. Or, about one sixth of what it was in 1980. In other words, it is much, much cheaper to borrow money for cars and houses, for absolutely everything, than it was 35 years ago. Why are interest rates so much lower than in 1980. Because the Federal Reserve has slashed rates in an effort to keep our struggling economy afloat. This is exactly the opposite of what happened in the late 1970s. And, it was even worse in 1980 when Ronald Reagan took office. The simple truth is, the Federal Reserve currently prints money with the velocity of a rocket car attempting to break a land speed record. And, there isn't a damn thing to back it up, not gold, not silver, just the nation's tenuous credit rating. All of this is done in a massive effort to keep the economy going. Likewise, because interest rates are so artificially low, the cost of repaying the nation's debts is a good deal lower as well. That is also why deficits can shrink more rapidly. Not because of president Obama's good fiscal policy—but in spite of it. Any attempt to compare unemployment rates for both Reagan and Obama has to consider these variables. Massive amounts of cheap money makes it easier to borrow, easier to spend, and even easier to repay, making it more conducive to job creation, as well. In spite of this, president Obama has failed to significantly either create jobs or to drive the economy. That is the real issue. "But, isn't inflation kept in check, at least? Isn't that a good thing?" Inflation is relatively low because people's real income is stagnant. Whatever gains they've made, are offset by high levels of personal debt and a sluggish economy. One of the ways in which average Americans really struggle is with high rents, the result of the growing demand for rentals. This is due in no small part to the recent financial meltdown in the mortgage markets, driven by easy money policies and government subsidized sub prime mortgages. When affirmative action in banking and housing is extended to poor people with poor credit, bad outcomes are as inevitable as rain. Any banker not hypnotized by the potential flood of federally guaranteed dollars would tell you so. In the end, it all travels in a circle. One bad idea, begets another and on and on, effecting food and fuel prices, rents, housing costs, you name it, and it costs more—all while the economy spirals downward in an inescapable cycle of borrow and spend, with subtly growing poverty for all but a few. President Obama inherited a mess, no one would argue with that. But, he's done remarkably little to repair it, except raise taxes, re-inflate the welfare state, while cutting military spending. Cutting military spending isn't necessarily a bad thing—until you look around and see the world fracturing along various fault-lines, each more complex than what he seems capable of handling. With his limited experience in actual governing, no one should be surprised. I could go on, attempting to disentangle the truth from the numbers, but it won’t really matter. Not as long as people can be easily swayed by disinformation. This is true even among relatively sophisticated observers. It is, in the end, far easier to offer platitudes about helping the poor, than it is to fix things. For our political classes that always means “poor me” that is their true mantra. It is about the maintenance of power. Politicians must get elected first—and then work to stay elected. If that means offering free money, free healthcare and free food, none of which are actually free, it still sounds good. And for too many Americans, that seems good enough.